From 2015-2018 Lenore Manderson is convening Earth, Itself, an integrative program of the humanities, natural and social sciences, and creative arts, designed to further conversation about the environment in innovative, engaging and inclusive ways. The aim is to highlight ways of understanding Earth, environmental change, knowledge systems and policy, to address some of the most complex problems of our time. Daniel Nepstad (PhD, Yale) is the Executive Director, President, and Founder of Earth Innovation Institute (formerly IPAM International Program), a research, policy, and outreach organisation that supports sustainable development in Brail, Indonesia, Colombia, Mexico, Peru, and Kenya. He is a forest ecologist and land-use policy specialist, and has studied the Amazon Basin for 30 years, with a focus on forest responses to climate change, land use, and REDD. He is a lead author of the Intergovernmental Panel on Climate Change (IPCC, Working Group 2, AR5). Kekuhi Keali’Ikanaka’Oleohaililani is at University of Hawai’i where she works on Indigenous GIS for sustainability goals, including for a program Kumokuhali I, aimed at encouraging and sustaining forest growth. She also leads the Halau o Kekuhim (classical dance compamny) and the centre of cultural knowledge for the Edith Kanaka’ole Foundation, which operates a number of programs for Native Hawai’ian cultural preservation and education. Thinking the Earth was the first signature event of Earth, Itself. The program included Keynote Lectures, and Dance Performance, after-lunch Lecture, and panel discussions on: Ways of Knowing, concerned with competing epistemologies and understandings of Earth; Sustainability and Development, considering the tensions of these two goals, and The Way Forward, on policy, community and institutional action. The event also hosted poster sessions, a Contact Improvisation dance workshop, and contemporary performance jam. The program was open to students and faculty, policy makers, community members, and others who care about the environment, cherish debate, or wish to dance. This program is an activity of The Institute at Brown for Environment and Society (IBES), an interfaculty initiative at Brown University. The Institute is concerned centrally with the challenges facing us in ensuring sustainable life, and so aims to stimulate conversations across the natural and social sciences, humanities and the arts. Lenore Manderson Visiting Distinguished Professor, Institute at Brown for Environment and Society, Brown University; and Professor of Public Health, University of Witwatersrand, South Africa. Shura Baryshnikov Teaching Associate, Department of Theatre Arts and Performance Studies, Brown University. Geri Augusto | Associate Professor of Africana Studies, Brown University. Richard Locke | Director, Watson Institute for International Studies, Brown University. Amanda Lynch | Director, Institute at Brown for Environment and Society, Brown University. 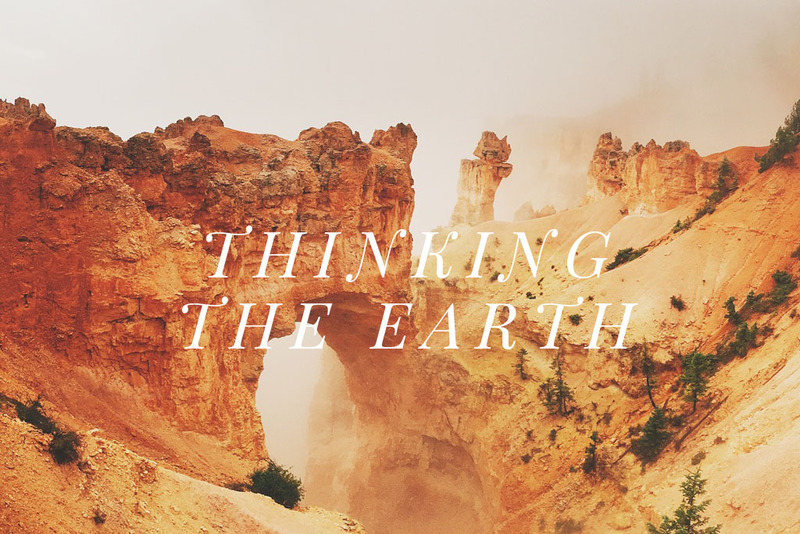 On April 23rd and 24th, the Institute at Brown for Environment and Society convened a national and international group of scholars, policy-makers, and performance artists as participants in its inaugural signature event, Thinking the Earth. This interdisciplinary conference, conceived and organized by IBES Fellow and Visiting Distinguished Professor Lenore Manderson, included two keynote lectures, three panel discussions, a research poster session hosted by students and faculty, a dance performance, and post-performance dialogue, workshop, and community jam. Thinking the Earth fostered intellectually charged discourse across disciplines and stimulated leading thinkers and artists to approach pressing social and environmental challenges in novel and profound ways. The Institute welcomed event attendees with an ample exhibition of more than two dozen scholarly posters. Students, postdoctoral associates, and faculty bookended the evening’s first sessions with presentations of their research from such diverse areas as ecology, earth science, public health, economics, and pathology. IBES postdoc Sarah Ivory received a prize for her exploration of the climate histories of African mountain forests, while Environmental Studies concentrator Alexis Durand was awarded the student prize for her investigation of the effects of the 2014 West Virginia chemical spill on local prison populations. IBES fellow Geri Augusto, Visiting Associate Professor of Africana Studies, launched the afternoon’s dialogue as moderator of Ways of Knowing, a panel discussion which explored the various approaches people take to understanding their environment. Hannah Freed-Thall, Assistant Professor of Comparative Literature, broadened the conversation with her juxtaposition of Proust’s tools of fiction with scientific, factual “flatness of knowledge.” Michael D. Kennedy, Professor of Sociology, also described ways to enhance scientific understanding, as well as to inform policy. His remarks emphasized the necessity of exploring kinesthetic knowledge that comes from different ways of valuing the land. Keisha-Khan Y. Perry, Associate Professor of Africana Studies, later discussed this land valuation among women of color in Brazil, primarily with regard to the difficulties they face in obtaining access to water, while Sarah Vaughn, a postdoctoral scholar at the University of Chicago, described the adapting, evolving relationship between women in coastal Guyana and their environment in the face of a changing climate. Indeed, climate change consistently emerged at the forefront of almost every discussion. Keynote speaker Dan Nepstad, Executive Director and founding President of Earth Innovation Institute, drew his remarks from more than 30 years of experience examining climate change policies and land use in the Amazon rainforest. Nepstad’s lecture explored the necessity of compromise between environmental organizations, large industries, and governments in order to secure a more sustainable future. Though such a strategy may seem counterintuitive, the fallout from industrial development often provides a stage upon which to advocate for continued sustainability initiatives. In addition to being industrially and federally viable, however, appropriate strategies for combating climate change must also take into account the culture and preferences of a land’s people. In the panel discussion Sustainability and Development, chaired by Richard Locke, IBES fellow and Director of the Watson Institute for International Studies and hosted at the historic John Carter Brown Library by IBES Fellow and library director Neil Safier, panelists examined the costs of development and need for customized local solutions. Shannon McNeeley, research scientist with the North Central Climate Science Center and affiliated faculty at Colorado State University, discussed the complexities of climate change adaptation for American Indian populations in light of regulations surrounding reservation land. McNeeley also stressed the importance of respecting stated wishes rather than perceived needs, a sentiment that was echoed by Elisabeth Huber-Sannwald, Associate Professor at the Instituto Potosino de Investigación Científica y Tecnológica in San Luis Potosi, Mexico. Huber-Sannwald focused her remarks on the importance of upholding traditional schemes of knowledge and engaging younger generations in envisioning a more sustainable future. Although environmentally sensitive solutions are now within reach in many parts of the world, unchecked industrial power continues to have wreak havoc on the planet’s ecosystems. To this end, David Bond, a cultural anthropologist at Bennington College, explored the ways that humankind can learn from environmental catastrophes such as crude oil spills. “We often think of oil as a commodity that occasionally causes disasters,” quipped Bond, “but perhaps it is more accurate to think of oil as a disaster that occasionally causes commodities.” Later, Ted Melillo, Associate Professor of History and Environmental Studies at Amherst College, spoke of the complexities in defining the term anthropocene, a difficult concept loaded with a volatile combination of high stakes and culpability. Undoubtedly, words are powerful entities – and according to keynote speaker Kekuhi Keali’Ikanaka’Oleohaililani, the natural environment will also benefit if humans reconsider their relationship to other, seemingly innocuous, terms. Keali’Ikanaka’Oleohaililani, founder of the Edith Kanaka’Ole Foundation, set the tone for her address with a traditional welcome dance, a hula embodied by intentional movement and evocative, primal chanting. After coaching her audience through the creation of an original, venue-inspired series of motions, Keali’Ikanaka’Oleohaililani described a series of traditional Hawai’Ian terms and gestures called Kinolau, a kinesthetic and linguistic scheme that emphasizes the oneness between what is spoken and what is spoken about. “There is no division between my lehua [Kinolau for a seed or embryo that springs forth] and the tree’s lehua,” she explained. “It’s the same flower. Every time we recreate this movement in dance, we also recreate the potential of a forest.” In Keali’Ikanaka’Oleohaililani’s view, Kinolau is only one way of entering the discussion about sustainability, but one that reveals a reverence for nature that is at once ancient and avant-garde. Such reliance on traditional ways of knowing and environmental stewardship championed throughout the sessions of Thinking the Earth seem to herald a hopeful future. In The Way Forward, a panel discussion moderated by Amanda Lynch, IBES Director and Professor of Earth, Environmental, and Planetary Sciences, participants drew inspiration from examples of community-led sustainability projects. Sandy Smith-Nonini, an anthropologist and activist based at the University of North Carolina at Chapel Hill, highlighted the enormous power of social movements in driving change, while Curt Spalding, Regional Administrator for the U.S. Environmental Protection Agency, recounted successful forms of community engagement, such as a landmark cleanup of Lake Champlain and restoration of a local brownfield. Nonini and Spalding joined Terhi Rasilo, a postdoctoral researcher at the Université du Québec à Montréal, in calling for a new paradigm. According to the panelists, researchers must curb their reliance on the predictive power of science in the face of such unprecedented environmental changes. Meanwhile, Ian Garrett, co-founder of the Center for Sustainable Practice in the Arts and Assistant Professor of Sustainability and Design at York University, took the long view. Within 10-15 years, he predicts that sustainable business practices such as collective energy use will begin to be adopted by facilities outside of the arts sector. Garrett was not the only participant to demonstrate that conversations about human impact are alive and well in the creative disciplines. Artistic expressions of kinesthetic knowledge were peppered throughout Thinking the Earth‘s academic sessions in the form of contact improvisation, a style of dance that requires movement artists to attend and adapt to choices made by their fellow performers. The dance project Aftershock: sampling impact debuted to a sold-out crowd and earned glowing reviews. A stimulating talk-back investigating the processes of research, inquiry, and choice was moderated by Katie Pearl, Aftershock dramaturg, along with Shura Baryshnikov, dance program convenor, and Kellie Rae Adams, ceramicist. During Aftershock, Adams’ clay floor had provided a completely blank canvas that was initially avoided, as dancers carefully and tentatively skirted its edges. By the end of the performance, however, boundaries had been cast aside and the clay was spattered with indelible traces of the performers’ presence. Adams’ work offered the audience a powerful metaphor, likening movement and communication to industrial and agricultural development and the power of human action. Through the collective effort of academics, researchers, policy-makers, artists, and a dedicated Working Group, Thinking the Earth painted a picture of a rich and varied global society with diverse needs and ways of understanding their world. Despite the many challenges that lie ahead, many participants and attendees came away from the event with a renewed hope that communities who gather together in a spirit of openness and cooperation can find the way forward. If Thinking the Earth is any indication, global engagement, tireless effort, and a hefty spirit of mutual respect will grant humans the capacity to transform true sustainability from an academic talking point into concrete reality.